Competition and exhibition of mixed choral music, female voices, children`s choir and popular dances. They can enter in the category in which they wish to participate and compete with the other groups entered; they can also take part in the Evening Concert to be held daily at the end of the day. Are invited groups from around the world, ready to meet the rules and live the spirit of the Festival. The groups must reach the artistic level and training required. 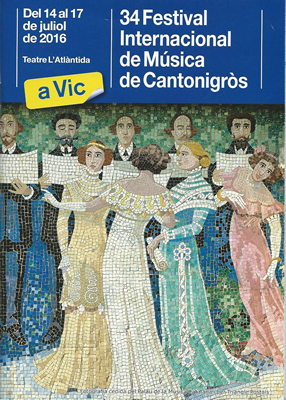 The concerts and competitions are held in the grounds of Teatre L'Atlàntida in the city of Vic. All participants will have available places to rehearse and prepare their work. They may remain in the Festival's area from morning until night. Mixed choirs of up to 40 voices. 1st- One obligatory work: «AVE MARIA» - Tomás Luis de Victoria (1548-1611). Editorial Clivis, Barcelona. One original composition before 20th century, (not an arrangement), sung in any language, with or without piano accompaniement..
An original composition after 19th century by a composer of the choir's own country, without instrumental accompaniment. A free work of any epoch with intrumental accompaniment or not. The total duration of the works chosen, together, can not exceed 15 minutes. 1st prize, 1800 € ; 2nd prize, 1200 € ; 3rd. prize 600 € . Children's choirs of up to 40 voices. Under 17 years of age on the day of the competition. 1st- One obligatory work: «PASAYAN XEXENAK» - Tomas Garbizu (1901-1989). Published by Diputación de Guipuzcoa, 1986. An original composition before 20th century, (not an arrangement), sung in any language, with or without piano accompaniement. The total duration of the works chosen, together, can not exceed 10 minutes. 1st prize, 800€ ; 2nd prize, 500€ ; 3rd. prize 300 € . Female choirs up to 36 voices. 1st- One obligatory work: «LLEGENDA» - Àngel Colomer i del Romero (1915-2001). Published by FIMC. One original compositions before 20th century, (not an arrangement), sung in any language, with or without piano accompaniement. 1st prize, 1200 € ; 2nd prize, 800 € ; 3rd prize 400 € . Mixed, male, female or children's choirs up to 40 voices. 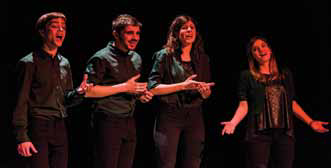 Three works chosen from the folklore of the country of the participating choir. The total duration of the works chosen, together, can not exceed 12 minutes. To take part in this competition, the group must take part in any other of the competitions. 1st prize, 600 € ; 2nd prize, 400 € ; 3rd. prize 200 € . Dance groups up to 35 members, including the musicians. Performing live music will be valuated. Two traditional folklore dances of the country of the participating choir. The total duration of the whole performance, can not exceed 12 minutes. 1st prize, 600 € ; 2nd prize, 400 € ; 3rd. prize 200 €. -Prize "Festival Internacional de Música de Cantonigròs". • When the first classified groups score the same number of points, the prizes in cash will be divided proportionally and the trophie will be given to all those who share the first place. • The decision of the Executive Commitee and the adjudicators will be final. This is an essential condition for participating in theFestival. Any claim should be sent in writing to the Musical Director of the Festival before the competition has ended. folk, arr. Ambro Copi: Da lipa ma! Ke bëj na jë? 10.00 h Competition num 1, Mixed Choirs of up to 40 voices. Three works of free choice: an earlier twentieth century, a later nineteenth century, and any time, with or without instrumental accompaniment. 15.00 h Competition num 3, Female Choirs up to 36 voices. Participation of the International Choral and Dance groups. 10.00 h Competition num 4, Mixed, male, female or children's choirs up to 40 voices. 15.00 h Competition num 5, Dance Groups up to 35 members, including the musicians. After the concert will be offer prices of the competitions 1, 3, 4 and 5. 11.00 h Competition num 2, Children´s choirs of up to 40 voices. Two works of free choice: a twentieth century before and after a century. 13.00 h International Children's Concert. Participation of the International Choral and Dance childrens groups. After the concert will be offer prices of the competition 2. 18.00 h International Concert & Ending of the festival. Clausure ceremony of the 34th Festival, sing of the Festival Hymn whith singers and public.